A long story, a complicated phenotype. Massive parallel sequencing technologies were an innovation in neurogenetics and made the discovery of many genes underlying familial epilepsies possible. However, some epilepsy syndromes turned out to be more “stubborn” than others. Now, in a back-to-back submission in Nature Genetics, two groups report on the gene underlying Familial Partial Epilepsy with Variable Foci (FPEVF). And no, it’s not an ion channel this time. Familial Partial Epilepsy with Variable Foci. We need to give a bit of background information to explain the concept of FPEVF. This syndrome is a familial syndrome, i.e. the diagnosis can only be made in families with multiple affected individuals. Even though the name of the syndrome might suggest otherwise, the epilepsy in each individual patient has a single focus, e.g. the patients have Temporal Lobe Epilepsy (TLE) or Frontal Lobe Epilepsy (FLE). However, in the family itself, focal epilepsies with variable foci can be seen. For example, in the pedigree shown in the figure, temporal lobe seizures, frontal lobe seizures and parietal lobe seizures can be seen. This however, must not be confused with multifocal epilepsy or migrating partial epilepsy, where multiple foci are seen in a single patient (and where the epilepsy is usually more severe). The variability of foci in the family sets FPEVF apart from many other familial focal epilepsies where the same focal epilepsy is seen in most individuals, for example familial frontal lobe epilepsy (mutations in CHRNA4, CHRNA2, CHRNB2 and KCNT1) or lateral temporal lobe epilepsy (mutations in LGI1). Dishevelled. The collaborators led by Dibbens and Ishida used exome sequencing to identify the gene underlying FPEVF. Previous studies had already established linkage in two large families to chromosome 22 and the candidate gene identified in both studies was within this region. DEPDC5 (or DEP domain-containing 5) is a gene of unknown function expressed in the CNS and based on the homology to the Dishevelled-1 protein, a role in signal transduction is assumed. However, the existing databases reveal nothing more about DEPDC5. While this might be frustrating at first glance, this new gene might provide a novel insight into the genetics of focal epilepsies, which are the most common epilepsy in man. Pedigree A1 of the paper by Dibbens et al. In families with Familial Focal Epilepsy with Variable Foci, different focal epilepsies can be found in affected family members. In this family, affected individuals have temporal lobe seizures, frontal lobe seizures or parietal lobe seizures. Follow up. Many other genes implicated in familial epilepsies are “loners”. They are identified in large families, but are virtually absent in singletons. The present studies have not look at singletons, but they followed up their findings in other families with focal epilepsies. 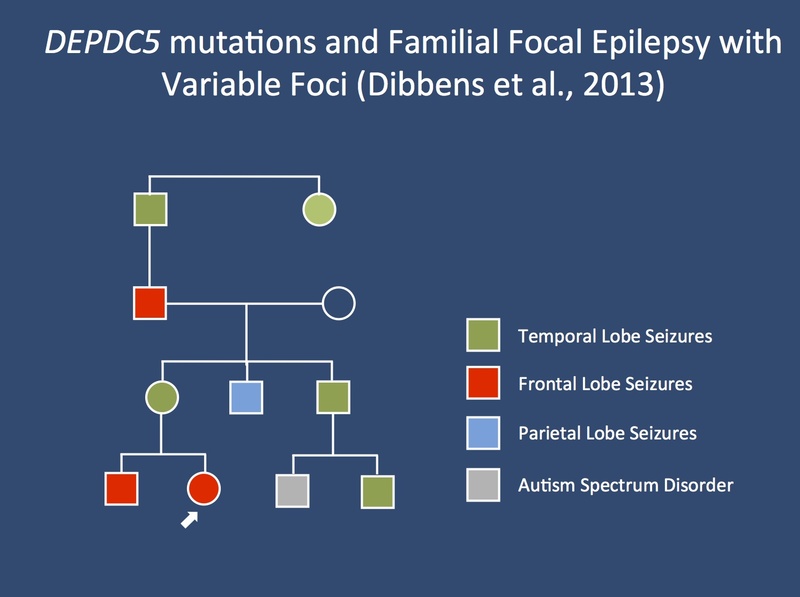 Both studies find a high frequency of DEPDC5 mutation in families with focal epilepsies, suggesting that they have identified a major gene rather than a rare mutation found in an individual family. This finding will certainly motivate follow-up studies in large case series of singletons. Also, DEPDC5 is likely to be included in many of the gene panels that are currently used. Implications for EuroEPINOMICS. While we have mainly focused on epileptic encephalopathies and recessive families, these findings might be a wake-up call for us to have a closer look at dominant families as well. As shown by the studies of Dibbens and Ishida, major genes for familial epilepsies are still out there. It will be interesting to see whether this gene can also be identified in common pediatric focal epilepsies such as in families with Benign Rolandic Epilepsy. This entry was posted in 2013, Familial epilepsies, Papers and tagged Autosomal Dominant Nocturnal Frontal Lobe Epilepsy, CHRNA2, CHRNA4, CHRNB2, DEPDC5, exome sequencing, Familial Focal Epilepsy with Variable Foci, KCNT1, LGI1, Temporal Lobe Epilepsy. Bookmark the permalink.